Watching this year’s Classic from afar, it was easy to see how calm, cool and collected Ott DeFoe seemed to be as he tried to win the biggest trophy of his competitive bass-fishing career. That, of course, was the big blue trophy that went to the winner of the 2019 Bassmaster Classic championship contested this past weekend on the Tennessee River near DeFoe’s Knoxville, Tenn. home. It was also easy to think about how much a man’s life can change in the span of only one year, a single 12-month spin on this third rock from the sun.Especially when we’re talking about the life of Ott DeFoe, the newly minted champion of the 49th Bassmaster Classic, the so-called Super Bowl of the sport. A year ago, DeFoe was a Bassmaster Elite Series pro with six career wins to his credit and nearly $1.7 million in earnings. Today, DeFoe is a member of the Major League Fishing Bass Pro Tour, having switched circuits last fall in the landscape-altering upheaval that rearranged the sport of professional bassing as we now know it. But thanks to his season-long Elite Series efforts last year, DeFoe qualified for the Classic on the Tennessee River system where he grew up learning to fish. 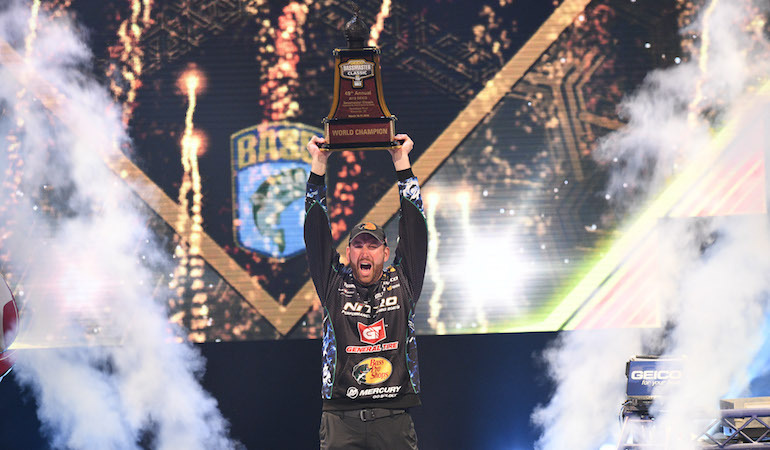 Over this past weekend, DeFoe had that chance as he fulfilled his career’s immense promise, claiming the 2019 Classic championship with family, friends, and virtually the entire bass fishing world looking on. Today, the Bass Pro Shops angler is the talk of the fishing world, the sport’s current king as he goes through several rounds of interviews for websites, newspapers, magazines, TV news programs and more. But only a year ago, he was still thinking about what might have been in his several previous close-call finishes, as well as wondering what the capturing of a Classic crown might ultimately mean for the 33-year old angler, his family, and his career. When I asked DeFoe if he could remember the first Classic that he attended, he quickly had the answer. “It was in 1996 and George Cochran won in Birmingham, Ala.,” smiled DeFoe, a fixture on Outdoor Sportsman Group television programming these days as host of The Hunt for Monster Bass and a co-host of Bass Pro Shops’ The Bass Pros, both on Outdoor Channel. Bass pro Ott Defoe says work on making the most accurate casts possible. DeFoe freely admitted in our discussion a year ago that the thought of one day winning the Classic kept driving him forward, even through the rough patches that inevitably come in the life of a professional angler. In many ways, DeFoe is an angler who seemed all but destined to one day win the Classic. In his eight straight trips to the event, DeFoe has now finished in the Top 5 a total of five times, including Sunday’s derby win. What’s more, he has never finished out of the event’s Top 25, a hallmark of angling consistency that has made him one of the sport’s most steady pros. With six professional tournament wins, DeFoe started the 49th Classic with the kind of Day One outing that pro anglers dream about, a limit of five bass from the Fort Loudoun-Tellico complex that ultimately tipped the scales at 20 pounds even. That was good enough for an opening round lead of more than 2 pounds over Roy Hawk and a dream about what might be. On Saturday, DeFoe’s dream of a hometown Classic win slipped just a bit as he weighed in five bass atonly 10 pounds, 15 ounces, a lightweight bag that saw him slip down to fourth place just more than 2 pounds behind Day Two leader Jacob Wheeler. On Sunday, DeFoe endured a slow morning that had him painfully ready to abandon his game plan as he began to feel his dream of a Classic crown beginning to slip away. A dream that began when he was a youngster, including a trip to one previous Classic with his then girlfriend and now wife Jennie, a derby where he had sat in the stands and predicted that he would one day win the event. With the 2019 Classic derby potentially being – maybe even likely being –DeFoe’s final attempt due to his switch from the Elite Series to the MLF Bass Pro tour, on Sunday morning, a lesser man, a lesser pro might have allowed himself to become mentally resigned to the idea that this was one career goal that would remain unfulfilled. But that’s not the kind of pro DeFoe is. Instead, he reached down, recommitted, and remembered a conversation with fellow Classic competitor Keith Poche the previous day (which was legal under Elite Series rules). As they prepared to weigh their fish in, Poche told DeFoe of catching and losing some decent fish near the outer wall of a marina near the dam of Fort Loudoun. On Sunday morning, frustrated by his efforts thus far, DeFoe journeyed towards the dam to see what might happen. While not as dramatic perhaps, it was somewhat reminiscent to what 2014 Classic champ Randy Howell did at Lake Guntersville a few years ago as he listened to a voice of divine inspiration deep in his angler’s soul, reversed course, and headed for a fateful bridge that would turn him into the king of bass fishing for a year. As the bridge had done for Howell, the marina wall proved to be golden for DeFoe as he boated four of the five bass he would weigh in later in the day at Thompson-Boling Arena. Those five bass would tip the scales at 18-14 and propel DeFoe back up the leaderboard to overtake Wheeler by nearly 4 pounds, as DeFoe posted a three-day total of 15 bass weighing 49-3. That was good enough for the come-from-behind win and fulfillment of a boyhood dream as DeFoe wept tears of joy from the stage, embraced his family, hoisted the Classic trophy high in a shower of canon-fired confetti, and claimed the $302,500 winner’s check. It undoubtedly was also a relief, a load off of DeFoe’s talented angling mind, to finally fulfill the promise of one day rising to the top of the competitive bass fishing mountain. On Sunday, DeFoe followed the same script that Howell had followed – and for that matter, Jordan Lee in the previous two Classics – as he carved out his own come-from-behind Classic triumph, forever removing his name from the “Best to Never Win the Classic” debate. As Wheeler had mentioned this week – and others too – when it’s meant to be for an angler, it’s meant to be. A year ago, in South Carolina, DeFoe had taken solace in that fact, having no clue that only a year later, he would be basking in its glory. “If you get to be in this sport long enough, it’s your day sometime,” DeFoe had prophetically said in our March 2018 interview as we stood in the parking lot for Media Day. “I’ve had my day in other events, in the Elite Series, in an Open,” he added. DeFoe – who is a man of deep and committed Christian faith – held tight to the belief that if the Good Lord wanted him to one day win the Bassmaster Classic, then on that day, nothing could stand in his way. “It (such a thought) keeps me grounded and I know that it’s going to happen when it’s supposed to happen,” DeFoe said in our 2018 interview. “God has a plan in everything and everything is perfect in His plan. And now, along with DeFoe, the rest of the bass fishing world knows and believes it too.